Job Creation from Startups: How does the Kansas City Region compare? This week the U.S. Census Bureau released interesting statistics showing how much of every metro area’s total employment came from startup businesses in 2014. The Census Bureau defines startups as firms that have been established for less than one year at the time the data is collected. The data excludes self-employed workers and several other categories (details here). How do we do compare to our 30 peer metros? 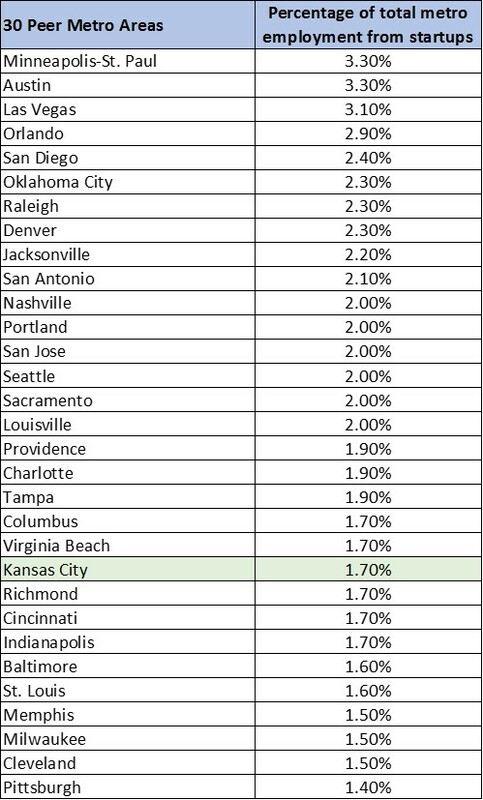 Kansas City falls in the bottom third of the list, at 1.7 percent. That puts us on a par with Columbus, Virginia Beach, Richmond, Cincinnati and Indianapolis. The region ranks slightly better than Baltimore and St. Louis (at 1.6 percent); Memphis, Milwaukee and Cleveland (1.5 percent); and Pittsburgh (1.4 percent). Those just ahead of us, at 1.9 percent, include Providence, Charlotte and Tampa. Minneapolis not only tops our peer metro list, but also leads the Census Bureau’s list of top 20 metros in the country for job creation from startups as a percent of total employment. The map below shows there is something of a geographical pattern to the data with lower startup employment in the Great Lakes region and generally higher rates in the South and West. The startup employment percentage is only one example of the data available from the Census Bureau’s Business Dynamics Statistics, which provides annual statistics on establishments, firm startups, and job creation and loss from 1976 to 2014 by firm size, firm age, industrial sector, state and metropolitan statistical area. These statistics provide snapshots of current and historical U.S. entrepreneurial activity, plus geographic and industry detail about where jobs are being created and lost in the U.S. economy.